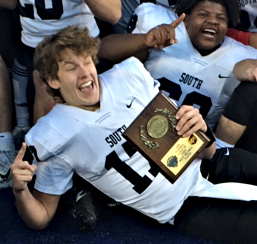 When South Warren took a 20-0 lead on defending champion Covington Catholic early in the third quarter of Sunday’s Class 5A title game, Spartans’ quarterback Gavin Spurrier and his coach Brandon Smith had entirely different takes on the situation. Spurrier said he thought he and his teammates “had it in cruise control” and were well on their way to a championship celebration. Smith felt differently. He thought the entire second half was slow torture, and admitted he felt like he has “going to have a stroke” when CovCath closed to within 20-14 and had a chance to tie it or take the lead in the closing minutes. 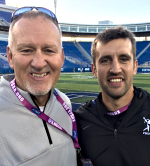 As it turned out, South Warren’s defense rewarded both the exuberant Spurrier and the apprehensive Smith by preserving a 20-16 victory on a windy afternoon at Kroger Field. It was a wild and crazy finish. CovCath, riding a 29-game winning streak that included a 43-7 beatdown of South Warren in last year’s semifinals, rallied thanks to Michael Mayer’s 58-yard touchdown catch and Casey McGinness’ 77-yard scoring run. The Colonels then threatened to take the lead when they drove to the Spartans’ 10-yard line with less than four minutes left. On the next play, McGinness bulled his way inside the 5. As the scrum heaved forward, there was no whistle, and as the bodies finally tumbled to the turf, the ball popped out. There to fall on it was South Warren linebacker Rowdy Shea. Spartans’ defensive tackle Jacob Lacey also said it was just a matter of doing what they had been coached. The game still wasn’t over. After CovCath forced South Warren into a punting situation, the Spartans chose to take a safety instead of risking having a punt blocked. So Clayton Bush took the snap and ran out the back of the end zone, allowing CovCath to close the gap to 20-16. 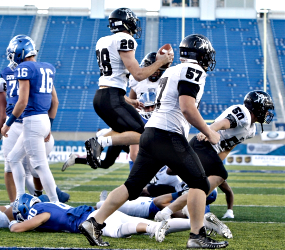 After the ensuing kick, the Colonels got the ball back, but with less than a minute left and the wind howling, they didn’t come close to scoring. Their last gasp was a pass to the end zone that a diving Jack Coldiron couldn’t reach. Chuck Smith, left, with his son Brandon after Sunday’s game. The Smiths now have 8 state titles between them. Smith, whose dad Chuck has coached Boyle County to six state titles, said he learned the importance of defense from his dad. Chuck Smith watched nervously, and excitedly, from the sidelines as his son guided the Spartans to their second undefeated state title in four years. Brandon Smith wasn’t the only Spartan with a more famous family member looking on. Spurrier’s grandfather, Steve Spurrier, was in the crowd at Kroger Field. Steve Spurrier was a Heisman Trophy-winning quarterback at Florida in 1966, and he went on to coach the Gators to a national championship. He also won plenty of games at South Carolina. Gavin, a 6-foot-3 senior, said he got some advice from his grandfather before the finals. Spurrier threw for 237 yards and 2 TDs against CovCath. For the season he passed for 2,731 yards and 41 TDs, and was intercepted only three times. But Spurrier, who’ll attend Duke as a preferred walk-on, knows what’s happening on the other side of the ball is important too. “Oh my gosh, we’ve got the best defense in Kentucky, probably the best in the nation,” he said. “They’re amazing. I’m so lucky. Gavin Spurrier, grandson of Steve Spurrier, threw for 2,731 yards and 41 TDs this season.